Denton County House Movers - We Move Anything! 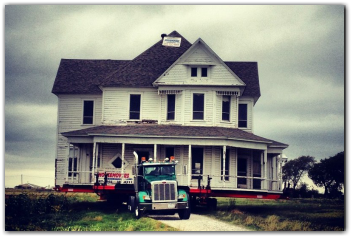 Denton County House Movers is the premiere house and structural mover in North Texas. We can move anything - from small portable classrooms to 3 Story Historical Houses. See us in action by viewing our gallery. While we normally stay in a 100 mile radius of Denton, we can and often do move to farther locations. With over 100 years combined house moving experience, you can trust your structure to be moved safely, promptly, and at a good price.You can learn more by taking a closer look at some of our previous jobs - click here. Moving buildings is what we do! It is in our blood and it is a family endeavor to be the best. We take our job very seriously, and so should you. Don't trust your building, home, or structure to just any mover. Come and speak to our friendly team about what you should know. We are confident that you will choose Denton County House Movers to complete your project. Let us compete for your business by filling out this simple online estimate form, free of charge. We will come to your location and give you an accurate estimate for the complexity, time, and cost of your move. Our Motto: We Move Anything! Our Mission: Provide a Good Move for a Good Price! Our Experience: 100 Years combined experience ! Moving - We can move portable classrooms to historical houses and anything in between. Leveling - We can safely raise and level most houses, businesses, and buildings. Sales- We have a variety of school buildings, houses, and other structures in storage on our lot and for sale to you at a fraction of the cost you might expect. SAVE A TREE MOVE A HOUSE! Structural Moving is one of the world’s oldest and largest recycling industries. Often relocated structures would otherwise be demolished and distributed to landfills. Our landfills are a limited resource that is already being abused with an abundance of waste. You can save over 100 cubic yards of landfill space just by relocating your average structure. Did you know that structural movers save over 2,500,000 trees in an average year by recycling structures? So let us help preserve our natural resources by considering us for your structural relocation needs. * Jerry Webb is a founding member of both TASM and IASM.